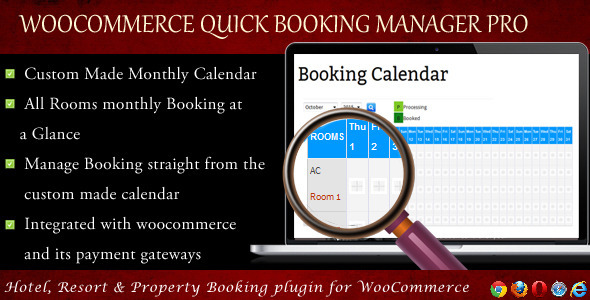 "WooCommerce Quick Booking Manager" plugin will enable online booking services for your site. You can show and manage your apartments/houses/hotel rooms/hotel/resorts (or something else) availability for rent. "WooCommerce Quick Booking Manager" plugin is integrated with WooCommerce Payment systems. - Very easy to install and configure. - Very flexible functionality. Fit to wide range of business. - All bookings and settings are stored in your DB. You don't need third party account(s). - An easy to use Booking Admin Panel that displays bookings in Calendar Overview and lets you manages bookings. - Payment System Integrated with woocommerce payment. - Built with jQuery, Ajax and other technologies. - Easy to integrate into your site because necessary post or page will be automatically created and shortcode will be automatically copied to page. - Make bookings in friendly booking interface ЁC select the date(s) and fill form fields. - Prevent of double booking for already reserved days (1 booking per 1 day for a particular room). - Comfortable Admin Panel for booking management. View bookings in Calendar Overview Panel (Timeline). - Pagination of the booking listing. - Administrator can edit specific bookings. - View the bookings in booking calendar of any month of any year. - Set Room category from admin. - Booking can be added from admin panel. - View the booking calendar at a glance. - "Booked" and "Processing" background color can be set. - Add custom CSS for frontend design. - Integrated with woocommerce payment system. - Booking calendar / availability calendar for a holiday home, bed & breakfast, condo or hotel. - Booking calendar / availability calendar for a room or office. - Booking calendar / availability calendar for a car or boat. - A booking calendar or availability calendar for community center or any party hall. - A booking calendar for equipment. - Booking and availability for clinic, medical rooms and words seat etc. - Unzip the file "wc-quick-booking.zip" and upload the folder to the "/wp-content/plugins/" directory. - Activate the plugin from "Plugins" menu in Wordpress Admin. - Now go to "Woo Booking Manager" of admin dashboard and create room category. - Create rooms/resort/else for booking. - Admin can edit booking from "Manage Booking" option. - View the overview of bookings in "Booking Calendar" option. - Admin can set booked and pending background color of Booking Settings option. - Advance user can add CSS (Cascading Style Sheet) from "Frontend CSS Fix" option. - Integrate with WooCommerce: Create a woocommerce product with SKU "sc_quick_booking" and save this product as "Pending". - Now go to frontend and click on to "Booking Calendar" link to add a Booking. Online Multi Restaurants Marketplace for WooCommerce; Prestashop Restaurant Marketplace; Prestashop Multi Vendor Marketplace; Woocommerce Hotel Reservation & Booking Marketplace; Magento Tailored Shirt Design Online; Online Cake and Cupcake Design for Woocommerce; WooCommerce Tailor - Ladies Dress. Keywords: booking calendar, booking module, booking plugin, booking system, bookings, calendar, hotel booking, reservation system, reservations, resort booking, schedule system, woocommerce booking system, wordpress online booking, wp hotel reservation system, wp reservation script.